If you’ve ever experienced an internet outage at your office, you know the havoc it can cause: employees can’t access vital systems, credit cards can’t be processed, IP phones are disconnected, and more! Having a backup internet connection for times like this is obviously a great idea, but backup connections can be expensive, difficult to install and configure, and cumbersome to maintain - especially for small businesses. Enter SimplyFailover. 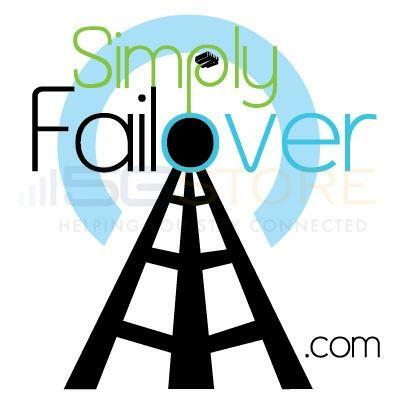 SimplyFailover is the easiest, most affordable way to provide backup connectivity for your business. With SimplyFailover in place, internet outages are a thing of the past! If your primary internet connection goes down, SimplyFailover's backup connection ensures that your network - including your employees' computers, your credit card terminals, your IP phones, etc - all remain online. No more lost productivity or lost sales due to internet service problems! How it works: SimplyFailover utilizes a professional-grade router that includes a built-in cellular modem that is connected to a 4G LTE network for backup internet access. 3Gstore can configure the SimplyFailover router differently depending on your current setup and your network needs - it can be used in conjunction with your existing router, or you can replace your current router with the SimplyFailover unit and have it handle all of your networking and WiFi needs. The SimplyFailover router maintains a constant connection to the 4G LTE network and any time your primary connection fails, the backup connection automatically - and seamlessly! - kicks in. Your office will never have to be without internet access, and all of your connected devices (computers, credit card terminals, etc) will remain connected to the internet without requiring any action on your part. What it costs: The initial charge is $99.99 or $149.99 depending on the configuration option you select. The base monthly fee is $49.99, and if your primary connection never goes down, that is all you'll pay. If your primary internet connection fails and SimplyFailover switches on, the first 5mb of data usage is free, and all usage thereafter is billed at $15/GB. EXAMPLE 1: In September, your primary connection is stable and never fails. You pay $49.99. There has never been an easier or more affordable option for providing backup internet to your business. NO router configurations to worry about, NO confusing installation, NO dealing with cellular carriers, NO paying for expensive monthly data plans you don’t need (remember, if your primary connection never goes down, all you pay is the base $49.99 fee! ), and NO huge up front costs for equipment. SimplyFailover can be integrated into your network in a matter of minutes, and then you’re covered any time your primary connection goes down. It really is that simple! More info: For answers to common questions about SimplyFailover, read the SimplyFailover FAQ. To order SimplyFailover, visit 3Gstore .